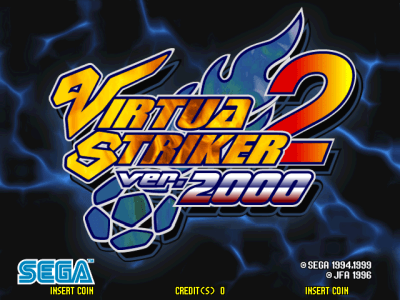 Virtua Striker 2 ver. 2000 © 1999 Sega Enterprises, Limited. 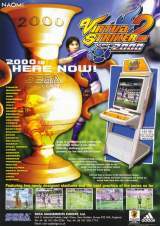 Virtua Striker 2 ver. 2000 was released in December 1999. * Play as Special MVS Team YUKI : A the Team Select screen, highlight Yugoslavia and press the Start button, then highlight USA and press the Start Button, then highlight Korea and press the Start Button, then highlight Italy and press the Start Button. * Selecting MVP Royal Genki : After inputting the MVP Yuki-chan code go to the box that appeared, highlight the box and press start and the three buttons. * Selecting FC Sega Team : Go to countries starting with F, C, S, E, G, A and press start once. i.e. France, Croatia, Spain, England, Germany and Argentina. A box will appear in the top left hand corner. 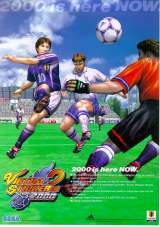 * Virtua Striker 1 background music : Press short pass and start button at the main title screen after putting in the token. * Opening ranking mode : After putting in your token, hold the joystick down and then press START at the main title screen.